Second only to the Transformers and G.I. Joe as the greatest cartoon/toy lines of the 1980s, Voltron broke new ground in marketing, demanding kids beg for not one but five different toys in order to assemble one giant robot. In hindsight it was pretty sneaky, and now that us children of the 1980s are all grown up, we should know better. But with mountains of disposable income and a nostalgic itch that demands scratching, who wouldn't want this glorious 30th anniversary edition of Voltron: Defender of the Universe? 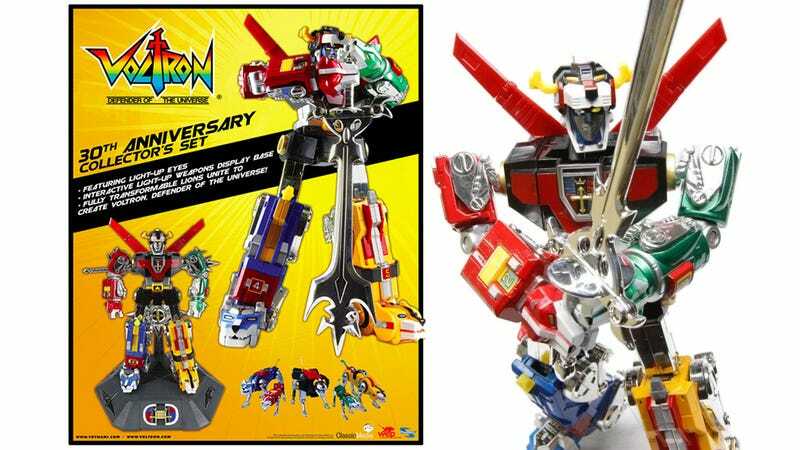 Like all the best toys, this Voltron re-issue is made from die-cast metal, so it feels nice and weighty in the hand. And when the five transforming lions are all merged they form an imposing 11-inch robot figure that comes complete with light-up eyes—a feature finally made possible by 30 years of electronics miniaturization.